I circulated the email to the “Blackbirds,” Twitter’s internal group for Black employees. In my three years as Manager of Journalism and News at the company, I was always thrilled whenever a new hire of color joined our ranks. By the end of the day, the Blackbirds were buzzing amongst ourselves. We lavished the new employee with our customary welcome to Twitter’s vibrant workplace. Weeks after our new colleague’s induction, I had to break the news to the group that I would soon leave the company I loved. Witnessing firsthand the lack of faces of color instilled in me the desire to apply my technology skills toward the visibility of Blacks in media. 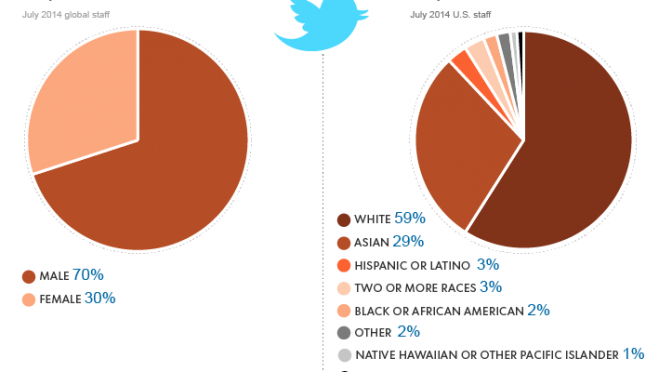 At Twitter, an estimated two percent of employees are Black, a number that is less than shocking to those who work inside its many offices. A cursory look around the company’s San Francisco headquarters would reveal a sea of mostly White and Asian faces. Facebook and Google’s self-reported numbers reflect much of the same. Both employ a few hundred Black workers among tens of thousands. The widespread underrepresentation of faces of color in tech is already alarming. However, the situation is more dire than raw numbers project. A deeper census would show that few of those accounted for occupy leadership or engineering positions compared to their fairer-skinned counterparts. So why aren’t there more Black people roaming the campuses of technology companies? The most impactful detriment to diversity in Silicon Valley is the idea of “culture fit.” Employees are actively encouraged to suggest friends or former colleagues for open roles. The premise is if the employee and the candidate have a congenial relationship outside of the company, the new recruit is more likely to work well with other staffers. The recommended candidates are given preference or special attention during the recruiting process. It should come as no surprise then that there aren’t more applicants of color to select from. White Americans have 91 times as many white friends as Black friends, according to the Public Religion Research Institute. Three-quarters of whites have entirely white social networks without any minority presence. If current employees don’t know any people of color then they have none to recommend. Additionally, candidates are pooled from the same universities. The Stanfords and Berkeleys of the world, which themselves suffer from low numbers of enrolled students of color, are considered the gateway to top talent. Black candidates who do get their foot in the door face another set of problems. Employees of color are statistically paid less by a considerable margin, according to the American Institute for Economic Research. Also, they will see very few people who look like them. At Twitter, the number of service, janitorial and security contractors of color far outpaced the number of full-time employees from minority backgrounds. Because of this shortcoming, nearly every Black and Latino employee at Twitter knew each other, if not by sight then by name. When we saw each other in the bird-themed hallways, we’d offer a head nod or smile, even if we worked on separate teams. Three or more Black or Latino staffers gathered together was a rare sight, one that would amusingly cause heads to turn. I empathize with managers who don’t consider racial disparity to be an issue worth resolving. Those who do not experience its effects firsthand will find it difficult to give it credence. But to put oneself in the mindset of a minority employee isn’t much of a stretch. Imagine for a moment being the only man at a bachelorette party or the only woman at a packed nightclub. There is nothing intrinsically wrong with either, but it is an unnerving feeling. After a while, you may withdraw into yourself or speak less. You need backup. You need people who look like you. While in my position, I was frequently the only person of color in meetings, both internal and external. On many occasions when visiting another company, a Black employee would pull me to the side. They’d say in a hushed tone “I didn’t know any of us worked there.” I assured them, though few in number, we did exist. I wholeheartedly commend Twitter and other companies like it who have taken action to amend the disparity. Like many Twitter employees past and present, I was overwhelmed with joy when official measures were announced that would diversify the workforce. Because of their centrality in online discourse, Black users want to see themselves reflected in the products in which they invest their time. Understandably, some platforms maintain impartiality. They cannot or do not tailor their product to particular demographics. However, communities of color want to know that at the very least they are represented in the company’s staffing. There is also a financial incentive for tech companies to invest in a diverse workplace. Advertisers are eager to crack the ethnic code and commodify online communities like Black Twitter. Explaining the social and search habits of these users often falls on the handful of Black employees, without regard to their position or team. Until my tenure at Twitter, I strongly resisted being “the Black guy.” I didn’t want to be the sole representative of a multifaceted group of people or be siloed into focusing on Black issues. My position shifted after the shooting death of Mike Brown and the inception of the “Black Lives Matter” protests. I realized that I and other Black employees could be the voice for a community of users who had been largely ignored or misunderstood by social media companies. At the height of the events in Ferguson, Missouri, I stood up in an office-wide meeting to make a declaration. I took a breath and encouraged my colleagues to feel free to “ask a Black guy” any race-related questions they had. Many approached me privately to take me up on the offer. My decision to leave Twitter was founded in that moment. I vowed to put greater focus on a side project that I’d been working on in whatever spare time I had. I poured my energy into DO U., a novel about the experiences of Black people in America, told through the lens of three students at a fictional college in the South. I was intent on contributing to the visibility of Black issues rather than stand idly by watching them flash across my screen in a waterfall of short messages. Tech companies who have not actively taken steps toward greater diversity cannot be granted more excuses for why they lack Black employees. The next generation of engineering dynamos of color currently have comparatively few references to look up to. A growing movement to educate children of color in the sciences and technology aims to alter this trajectory. Younger social media and internet users must be shown that technology like Twitter is not simply a means for communication. It is also a platform that they can build on and influence. Hackathons must become as popular as science fairs for the next generation to have a chance at positions in the tech industry. The deficiency of people of color is a complex and cyclical problem that should be addressed at every point — from education and recruitment to employee retention. This change will require more than posting a hashtag in a public venue or darkening the color of a logo on a T-shirt. The key to a diverse workplace is the allocation of resources to internal and external initiatives and, most importantly, the will to see its improvement. Tech companies must reflect the communities they serve. If not, they risk alienating the users most responsible for their success. There will be a point when the brief public shaming that accompanies jarring diversity reports will not subside. If the new age of social media has demonstrated anything, it is that a smattering of voices can snowball into a powerful and sustained protest. The core of Black users who have initiated worldwide movements will turn their attention to the platforms themselves. To ignore the racial makeup of a workforce is also a disservice to the company itself. The best teams don’t share similar backgrounds or perspectives. Without a variety of voices contributing ideas, the workplace becomes a homogenized environment where potential brilliance may never be achieved. Diversity should rightly be seen as a benefit to growth, not an obstruction to avoid. Mark S. Luckie is the former manager of journalism and news at Twitter. He is the author of The Digital Journalist’s Handbook and DO U., a novel about life at a historically Black college. Luckie is a career journalist and part of the 2012 Pulitzer Prize finalist team for Local Reporting.